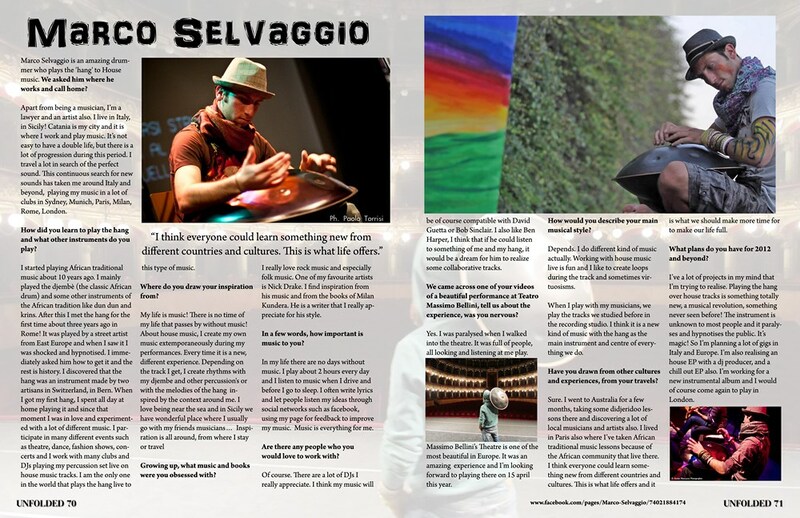 Marco Selvaggio is an amazing drummer who plays the 'hang' to House music. We asked him where he works and call home? Apart from being a musician, I’m a lawyer and an artist also. I live in Italy, in Sicily! Catania is my city and it is where I work and play music. It’s not easy to have a double life, but there is a lot of progression during this period. I travel a lot in search of the perfect sound. This continuous search for new sounds has taken me around Italy and beyond, playing my music in a lot of clubs in Sydney, Munich, Paris, Milan, Rome, London. How did you learn to play the hang and what other instruments do you play? I started playing African traditional music about 10 years ago. I mainly played the djembè (the classic African drum) and some other instruments of the African tradition like dun dun and krins. After this I met the hang for the first time about three years ago in Rome! It was played by a street artist from East Europe and when I saw it I was shocked and hypnotised. I immediately asked him how to get it and the rest is history. I discovered that the hang was an instrument made by two artisans in Switzerland, in Bern. When I got my first hang, I spent all day at home playing it and since that moment I was in love and experimented with a lot of different music. I participate in many different events such as theatre, dance, fashion shows, concerts and I work with many clubs and DJs playing my percussion set live on house music tracks. I am the only one in the world that plays the hang live to this type of music. Growing up, what music and books were you obsessed with? I really love rock music and especially folk music. One of my favourite artists is Nick Drake. I find inspiration from his music and from the books of Milan Kundera. He is a writer that I really appreciate for his style. In a few words, how important is music to you? In my life there are no days without music. I play about 2 hours every day and I listen to music when I drive and before I go to sleep. I often write lyrics and let people listen my ideas through social networks such as facebook, using my page for feedback to improve my music. Music is everything for me. Are there any people who you would love to work with? Of course. There are a lot of DJs I really appreciate. I think my music will be of course compatible with David Guetta or Bob Sinclair. I also like Ben Harper, I think that if he could listen to something of me and my hang, it would be a dream for him to realize some collaborative tracks. We came across one of your videos of a beautiful performance at Teatro Massimo Bellini, tell us about the experience, was you nervous? Yes. I was paralysed when I walked into the theatre. It was full of people, all looking and listening at me play. Massimo Bellini’s Theatre is one of the most beautiful in Europe. It was an amazing experience and I’m looking forward to playing there on 15 april this year. How would you describe your main musical style? Depends. I do different kind of music actually. Working with house music live is fun and I like to create loops during the track and sometimes virtuosisms. When I play with my musicians, we play the tracks we studied before in the recording studio. I think it is a new kind of music with the hang as the main instrument and centre of everything we do. Have you drawn from other cultures and experiences, from your travels? Sure. I went to Australia for a few months, taking some didjeridoo lessons there and discovering a lot of local musicians and artists also. I lived in Paris also where I’ve taken African traditional music lessons because of the African community that live there. I think everyone could learn something new from different countries and cultures. This is what life offers and it is what we should make more time for to make our life full. What plans do you have for 2012 and beyond? I’ve a lot of projects in my mind that I’m trying to realise. Playing the hang over house tracks is something totally new, a musical revolution, something never seen before! The instrument is unknown to most people and it paralyses and hypnotises the public. It’s magic! So I’m planning a lot of gigs in Italy and Europe. I’m also realising an house EP with a dj producer, and a chill out EP also. I’m working for a new instrumental album and I would of course come again to play in London.